That's right. After several years of offering a variety of prints in my etsy shop, recipe for crazy, I am making a little change. When I opened my shop I had three prints that I designed and offered as reproductions. I had just left my career as a graphic designer to stay home and raise my newborn baby girl. 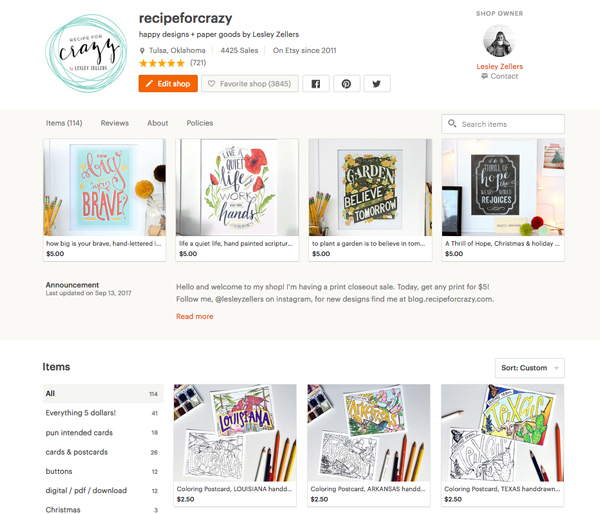 I had a lot of free time on my hands and wanted to continue pursing my love of design so I opened an etsy shop. My shop grew. I created and offered more designs. Sales grew. My customers grew. And, my family grew! I loved creating. I loved fulfilling orders and meeting new friends through those sales. I also liked the feeling of helping financially contribute to my family, especially since we were down to one income. Now that I am a mom to three and just recently jumped full in on homeschooling them (I don't think I've shared that here, just on instagram, so yes, we are homeschooling this year), I feel like it's time for a change. I'll share more about other changes coming to the shop soon, but for now, I have decided to clear out my inventory for all prints. This was not an easy decision for me and one I've been wrestling with for a while. That said, I've decided to go ahead do it because I think it will be best for my family and hopefully open up some time I would have otherwise spent packing and shipping orders. This does not mean I'm closing my shop. I will still offer postcards, greeting cards and buttons and maintain all wholesale clients and orders, but the days of being able to order a 5x7 or 8x10 print and have it delivered to your mailbox, well, those days will soon be gone. A closeout sale wouldn't be complete without a massive discount on remaining inventory so I have marked every print down to 5 dollars! That's right, every single print. 8x10 "Coffee and Jesus", $5. 5x7 "How Big is Your Brave?" 8x10 "Linger Longer" - that's right, $5. ALL prints are only $5 (while supplies last). I can't do this without saying thank you to every single one of you that has supported me by purchasing prints over the years. You have made this Okie girl feel so blessed. You made some of my wildest dreams come true and I cannot say thank you enough. Really, Thank you. Alright friends, hop on over to the shop and grab some of these deeply discounted prints before they're gone!